It has been a while since I published a new free Blogger template, so without further ado, I present Haute Press, the first in a series of templates I have called my Lummoxie themes. 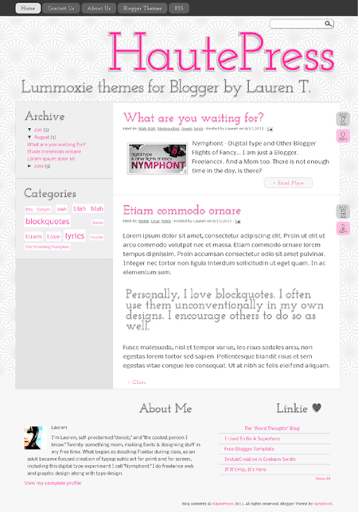 Some extra features of this template include the top menu which utilizes Blogger's new PageList widget, and the post summary feature utilizing Blogger's page-break feature.Another bonus is that this template is "liquid," or "fluid," meaning that it is not fixed-width, it will fit to virtually all screen resolutions. →Download not available as the template has been updated. Optional and customizable menu/linkbar with "dynamic" highlighting of current page, utilizing Blogger's new PageList widget feature. Super easy to use and customize, details below. The Page List Widget has been customized to fit the template. Page links will be automatically added, and other additional links can be added via the pages section of the Blogger dashboard. This menu features "dynamic highlighting" of the current page. If a menu link is the current page, that link in the menu is "highlighted" automatically. As in the demo page, when at the index or home page, the "Home" link is highlighted. Click on any link in the demonstration menu to see the "dynamic highlighting" in action. This section is also optional and may be removed. No scripts are necessary in using the read more feature on this template, as it utilizes the in-place "post-break" feature in Blogger. Simply add a page break when and if you would like a post to be summarized. Have no fear, I promise setting up the post date is easy-peasy-lemon-squeezy. Go to Dashboard > Settings > then Language and Formatting. From the "Date Header Format" select "DD Month YYYY" style, (two digit day, name of month, four digit year with no commas) and then select "Save Settings." Be sure that you select the format with no commas, or else it will not display correctly. Posts published on the same day will display a blank post date (just an empty grey box) because of the calendar style date set-up. At present there is no way around this (that I know of), so remember to select a different date with the "Post Options," if publishing multiple posts on the same day. I have to do this myself with this blog actually. The only images in the template are the background image and the searchbox image. If you do have access to your own image host, you might want to host the images at your own server. Replace image URL's in the code with the corresponding URL's at your server. Images are also now included in the zip download for convenience. Feel free to contact me or leave a comment if you need assistance replacing the images. At this time I am having difficulties with Bloggers post sharing buttons so they are turned off in the template, and it is advised that users have them "turned off" as well. I apologize for this, and I am working on it. Please do feel free to share your thoughts on this template in a comment! If you need any assistance with this template, feel free to leave a comment below. I hope you like it!